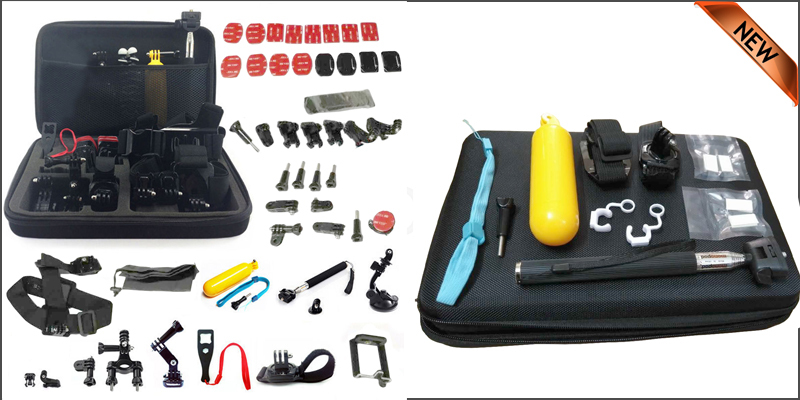 New and high quality 60 pcs accessories set kit for GoPro hero. It’s made of high quality plastic metal nylon. With this one of GoPro accessories, you can install your camera on your chest, wrist or head,making it easy to capture the fantastic moments on your trip free of hands. The bright yellow, easily seen floating handle of GoPro accessories can used for water sports, helps avoid losing, sliding or dropping your camera. A cool, special and practical design. It’s very convenient for keeping all accessories and your camera together. A necessity bag for traveling and outdoor sports makes it more convenient for travel. All in one conformed most of your use for supporting accessories when you are taking photos or videos to your GoPro hero camera. Material:: High Quality Plastic, Metal,Nylon. Compatible with: GoPro HD Hero 1/2/3/3+/4.